The sea wall on Plymouth Sound with views to Drake’s Island. 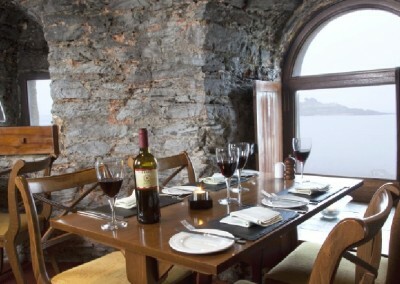 The Artillery Tower Restaurant sits in a 15th century tower overlooking the sea. Available Wednesday and Thursday Dinner. Advance bookings only. We have a special dinner menu. Scroll down. Note, for this night, a non-refundable deposit of £25 per person is required when booking. 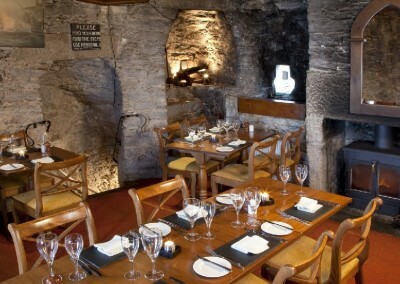 The Artillery Tower has been run by myself, chef Peter Constable and my wife Debbie, for more than twenty years. 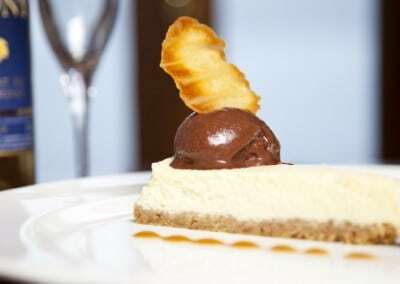 It offers some of the best restaurant dining in Plymouth. The Michelin-rated restaurant focuses on sourcing the best local produce, combined with proper cooking, and a relaxed informal service. And the wood-burning stove and exposed stone walls create a friendly atmosphere. The restaurant is set quietly a few minutes drive from the city centre. And it’s only 100 metres away from the Royal William Yard. There is plenty of free parking is available nearby. 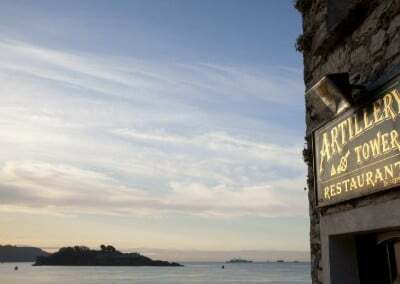 We look forward to welcoming you to our Plymouth restaurant. OPEN FOR DINNER: Wednesday – Saturday, arrival from 7.00pm. Last orders: 8.30pm, doors close: 11.30pm. CLOSED: Sunday – Tuesday, and lunchtimes. We do suggest wearing clothing sensitive to the season, especially outerwear coming to and leaving the restaurant. The weather can get a bit wild. Not scary in any way, and perfectly safe, but best you be prepared. 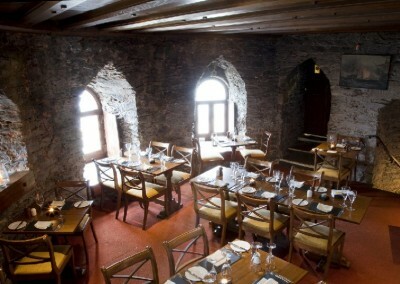 The Artillery Tower has been run by myself, chef Peter Constable and my wife Debbie, for more than fifteen years. It offers some of the best restaurant dining in Plymouth. The Michelin-rated restaurant focuses on sourcing the best local produce, combined with proper cooking, and a relaxed informal service. And the wood-burning stove and exposed stone walls create a friendly atmosphere. 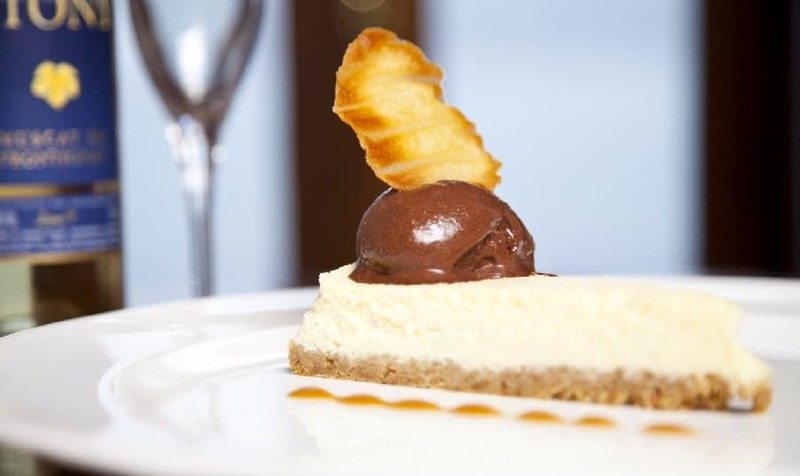 The philosophy of our ever-changing menu respects the traditions of classical cuisine. We value proper preparation, freshly-made stocks, sauces and pastries. Note we make our own bread, pasta, chocolates and fudge (yum!). 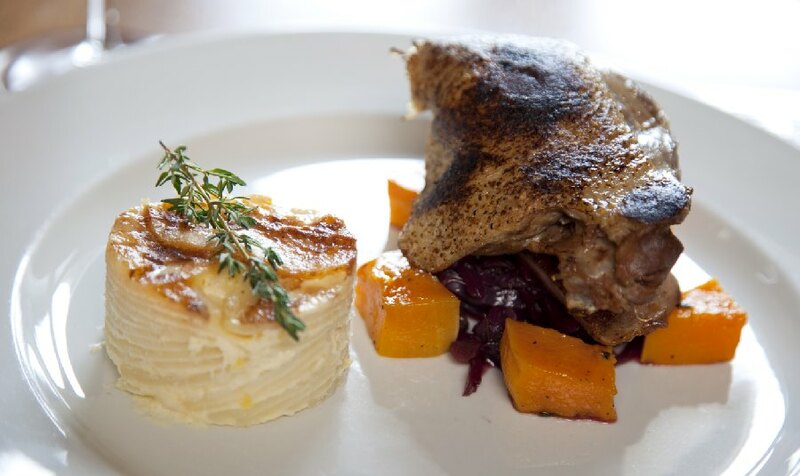 The food you enjoy at the Artillery Tower focuses on fresh, local and seasonal ingredients from artisan suppliers. Good food needs great ingredients and we make every effort to source the best produce we can using our many years of experience. 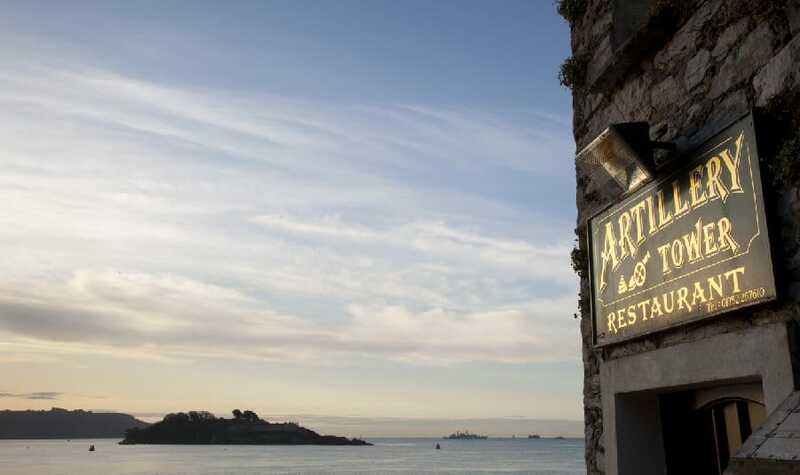 The Artillery Tower is proud to provide the only fine dining experience close to the Royal William Yard. Indeed, with our unique location and stunning sea views we are a fabulous choice. Located close to the Royal William entrance our Plymouth restaurant menus offer sophistication and good food in equal measure. With a great choice of restaurants in and around the Royal William Yard you should really come down and seek us out, it’s well worth it. Howells Butchers,Tavistock – Otter Valley Organic Poultry, Newton Abbot. Ocean Harvest, Andy Trust, Looe – Finest day boat fish. Trewithen Farm Dairy, Lostwithiel – Milk and cream. ESSENTIAL. Varietal based wines, available by-the-glass. CLASSIC. Household names from quality producers. INDULGENT. High-end producers for that special occasion but not exclusively. Wine you would expect to find in a small restaurant like ours. Medium dry with peachy notes. Soft, approachable with plum and blackberry fruit. Silky dark fruit spice, hint of vanilla. Cassis, fruity with cedar notes. 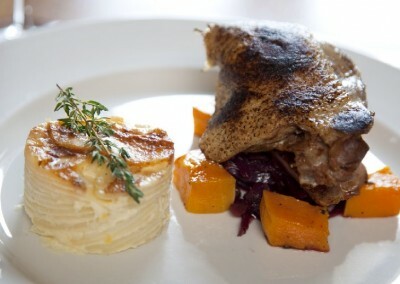 The main dinner menu is three courses: £48.50. Plus we have a tasting menu (for the whole table) at £60 on Wednesdays and Thursdays, on request. Bookings are from 7.00pm Wednesday to Saturday. Last orders: 8.30pm. We close at 11.30pm. Note we now ask for a £25 deposit per person on Friday and Saturday reservations (and all bookings for six or more diners), paid by card. See the terms below. Because of increasing numbers of no-show bookings, we now ask for a deposit of £25 per person for all dinner reservations for Fridays and Saturdays. And for parties of six or more on any evening. 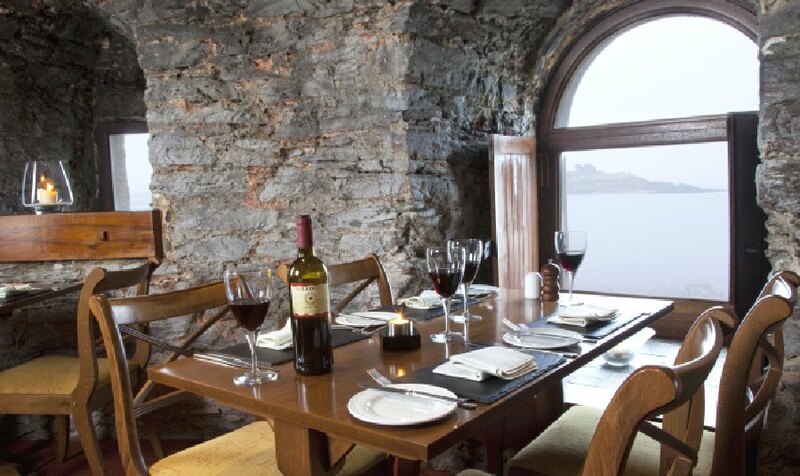 To guarantee such bookings we require credit/debit card details and charge £25 per person when we have confirmed the reservation. The booking may be cancelled without charge up to 6.00pm on the preceding day, and your card will be credited accordingly. But note cancellations MUST be by telephone and you must be given a cancellation number. An email or voicemail message is not sufficient. If we manage to fully re-book your table, then we will also refund your deposit in full. Partial re-booking will result in partial refunds. For example, you have booked for four persons and we re-book your table for just two, then only two deposits would be refunded. Similarly, if you book for say, four and turn up as two, then two deposits will retained. We trust these terms are fair to everyone, and welcome your comments. It’s a shame that some people are so irresponsible making restaurant bookings, and hope you understand the need for deposits especially on Saturdays. We can accommodate vegetarians and special diets, but with advance notice please – so we can discuss exactly what dishes we could offer you. We will ask when you book about specific dietary needs, and possible allergies. We prepare everything ourselves and can provide full information about our dishes. We are aware of, and fully comply with, the 2014 ‘EU Regulation 1169/2011’. A discretionary service charge of 7% will be added to the final bill on tables of 8 or more. Note, we never use gratuities to make up the minimum wage. Whilst the menu shown below is very recent, it may not be exactly the menu for today. Ring us if you have a specific question. Plymouth and its restaurants are easily reached. Our restaurant is near the ferries and the Docks, so just follow the signs. 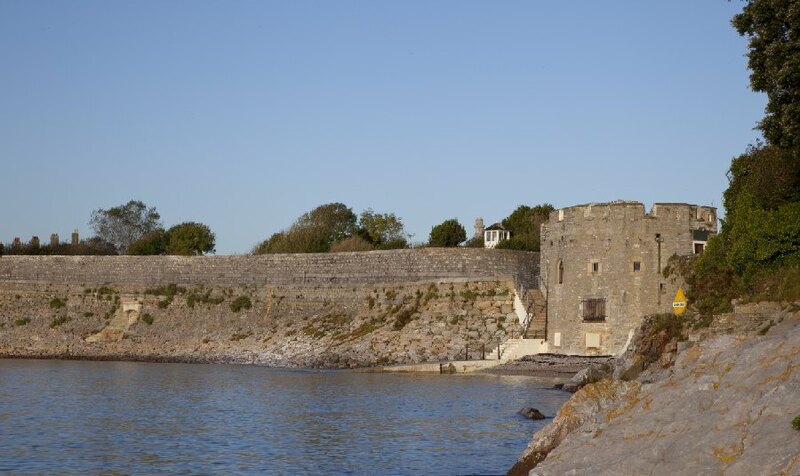 Firestone Bay Artillery Tower dates from the early 1500s, and is one of the oldest complete military buildings on Plymouth’s sea front. 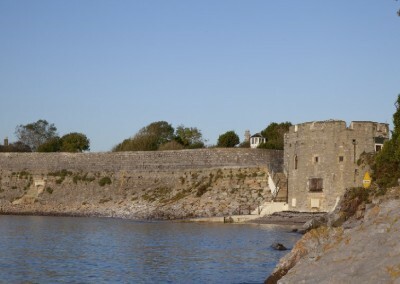 This tower protected the deep water passage at the North of Plymouth sound, between Drake’s Island and the main water front. Piers Edgecumbe acquired most of the land of the then ‘City of Stonehouse’ by his marriage to the heiress to the estate – Joan Durnford. He was granted license to improve and fortify the land by Henry VIII in 1539. 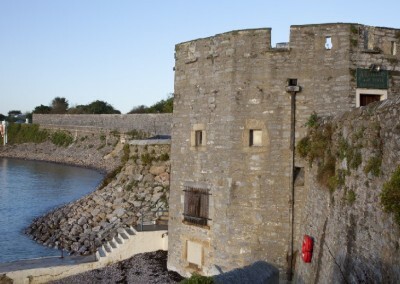 The tower was one of the fortifications, along with a city wall, to protect Stonehouse from attack by seaborne raiders. The lowest gun-ports in the tower (now blocked) were designed to enable the defenders’ cannon to inflict maximum damage on enemy ships. These improvements and fortifications were a wise precaution. For in 1544 France turned her energies from Spain towards England. Then, in 1588 the tower would have been the only permanent defence against the Spanish Armada. In the 1660’s, Charles II built the Royal Citadel on the Hoe with gun positions pointing at Plymouth and the sea, so the Tower’s role began to diminish. In Worth’s 1884 document, ‘The History of Plymouth’ the Artillery Tower was briefly named ‘The Winter Villa’ when it was a police house. It has also been a coastguard station, Ministry of Defence store and a public convenience! Conversion to a restaurant was in 1983. 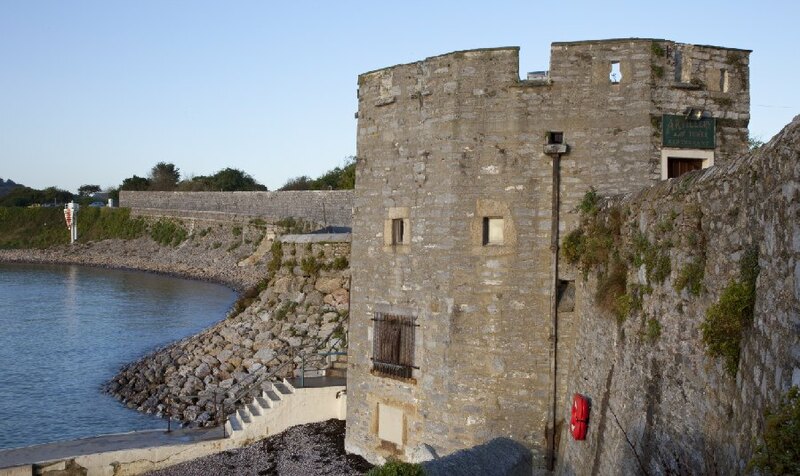 The Artillery Tower is one of the most preserved fortifications from Tudor times. Put the cream, garlic, salt and pepper over heat bring to a gentle simmer and infuse for 15 mins. Remove garlic from the cream. Add the potatoes and bring slowly to a simmer cook for 10 mins frequently stirring gently. Transfer to a suitable sized dish and bake until golden brown. 50g dried ceps soaked in enough water to cover them. I use the Italian brand from Sainsburys. White truffle oil to taste also available from Sainsburys. Melt butter in a suitable pan large enough hold all the ingredients. Add the onions and garlic to the pan and sweat them until soft but not coloured. Add the fresh mushrooms lower the heat and place a lid on and sweat the mushrooms until they have completely wilted and has created it own stock. Add the dried mushrooms and water. Add half the stock and bring to a gentle simmer and cook for 20 mins. Add cream. Remove from heat and blend until smooth. At this point you may need add more stock to get the desired consistency. Add salt and pepper to taste. Drizzle truffle oil just before serving. If you are going spend the £20 it costs to make this soup. I would advise making a homemade chicken stock, the results are better. If you are going to use a stock cube watch the salt. In a large saucepan melt half the butter. Pick over the parsley leaves, chop the stalks, reserve half of the leaves. Sweat the leeks and parsley in the butter until soft, add the chicken stock and simmer until potatoes are cooked. Whilst the soup is simmering chop remaining parsley, blanch in boiling water for 30 seconds, plunge under cold water and drain. Blend soup with blanched parsley and pass through a sieve. Blend in butter and cream. Season to taste. Soak beans overnight. Drain and put with all the above ingredients in a pan. Bring to the boil and simmer until beans are ender Remove bacon from the pan and blend. If soup is too thick add water or milk to get desired consistency. Pass through fine sieve. Blend in 50g of butter (optional). Check seasoning. NB Do not add salt during the initial cooking of the beans (beans will not soften if you do). Choose from a limited menu on the day. This gives you a choice of four dishes at each course. The menu changes so you will have to make your choices 10 days prior to you meal. Or, create a no-choice menu, by taking any dish from the menu. Choose from one our party menus. Contact us for details. Or create a no-choice menu of your own, by taking any one of the dishes on our menus. The reason we ask you to have a no-choice menu is that it make service on the day so much more efficient, and therefore relaxed. We will of course always offer alternatives for one or two in a party who cannot eat any particular item. 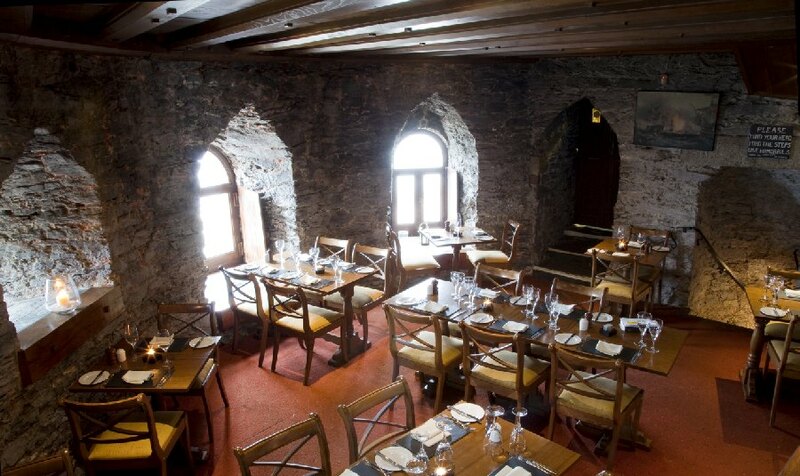 UPSTAIRS is our main dining room, the ‘Upper Deck’ with views across Plymouth Sound and Mount Edgcumbe. It is for as few as 20 up to 32 people (above 26 its very tight) If less than 20 people, we will need to add a room hire charge. This for the exclusive use of the room. 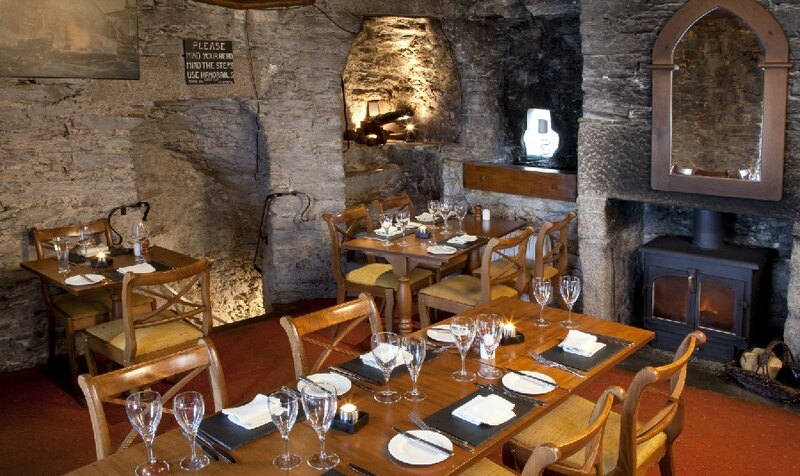 THE GUN ROOM is our downstairs dining room for 10 -16 people. Very popular for small business dinners/lunches or family gatherings. If less than 10 persons we will have to add a room hire charge. This for the exclusive use of the room. We need to finalize which menu you are having, well in advance. We must know numbers 48 hours in advance, or else numbers as of that day will be charged. An advance deposit of £10 per person is required in order to secure the booking.